→XPlace Review – Earn $39 for Writing 250 Words! XPlace Review – Earn $39 for Writing 250 Words! Welcome to our Xplace Review! We have experience of more than 200-250 make money online opportunities and today we are going to take a look at one of the most interesting ones. I have seen lots of scams on the Internet and services that are not very interesting. Xplace seems to be different and it provides you to earn a good income online. It also provides you a possibility to outsource your projects to high-quality freelancers. Founded: In 2004 by Allon Mason. Based in Los Angeles. 1.Earn money as a freelancer. I think that the idea of Xplace is great. It helps people all around the world earn some money while working from home, beach, cafe or literally anywhere. At the same time, it gives small business owners a possibility to find easily people who would be interested in doing the work for him. Here is an introduction video made by Xplace team which explains in a simple way how their service works. I recommend taking a look because it helps you understand their website better and what kind of benefit it can provide for you. If you are wondering, why some of the videos on their YouTube channel are in Hebrew, it’s because they have an office in Israel and in Ukraine even though Xplace is based in Los Angeles. What Can You Buy in Xplace? It’s amazing how much Internet helps to connect people all around the world. I found, for example, my last job through the Internet. I left my CV on a platform contacted me then. I worked for the company for +7 months but recently I quit because I want to concentrate more on building a successful online business. I had also left my profile on another platform already a long time ago and recently a Finnish bank (at least I guess so because of their subjects) contacted me because they wanted me to write blog posts on their website to boost Google rankings. I have also ordered a tens if not hundreds of articles from freelance writers through different platforms including HireWriters. Even the sky is not a limit on Xplace and other freelance marketplaces. How Much Can You Earn in Xplace as a Freelancer? Anyway, I will take here a few examples which illustrate how Xplace works and what kind of income you could expect. Let’s have a look what kind of projects people have recently ordered in Xplace. Somebody ordered a website for a travel company and is willing to pay up to $500 for this project. In the top of this picture, you can see the details of this project. Budget is up to $500. Bidding ends in 32 days and 8 hours. Freelancers have bid from $17 up to $70 per hour or $28-1,929 per project. This information will give you some hint what kind of bid should you give. You can leave your own bid on the right. Then you have an opportunity to write bid comments and add attachments that could boost your possibilities to get applied (for example CV or some examples that you can really create a travel website). Let’s have a look at another example. Somebody is looking for a ghost writer and seems to be ready to pay you quite well. You can see that this guy needs only 150-200 word articles. The average amount of bid is $39 per 250 words. In my opinion, that’s really good in this kind of freelancer website. I could write 250 words in 20-30 minutes (depending on the subject) which means that my hourly rate would be about $100/hour in this project. Okay, let’s admit that probably I need to review my article very carefully so it can take some time but still this proves us a point how good money it’s possible to earn on Xplace. What Is the Price of Xplace? As I mentioned above, freelancers need to pay a monthly fee in order to work through Xplace. 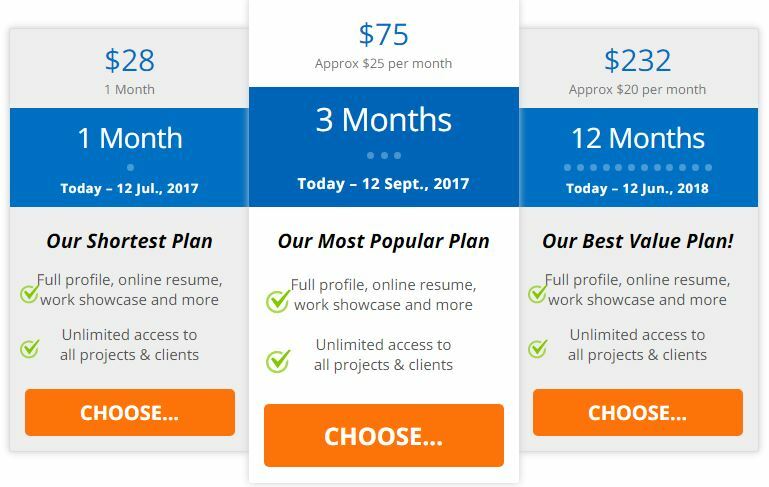 There are currently 3 different plans $28/month, $75/3 months or $232/year. You can see the details in the picture below (the screenshot was taken 12.6.2017 so the system has calculated dates according to it. I would like to hear what do you think about prices and the fact that you need to pay something in order to work through Xplace. Please leave a comment below to let me know your opinion. A great thing in Xplace is that you don’t need to pay any fees for accomplishing jobs because you pay this monthly fee. It allows you to earn bigger percentage than it would be possible in other freelance marketplaces. Conclusion – Does Xplace Work? Yes, Xplace works for its purpose to connect freelancers and small business owners. I always say that this kind of services is wonderful. Imagine that 20 years ago people could have only dreamed of this kind of platforms like Xplace. When it comes to work, there are always two choices in life. You can either build your own business or build someone else’s business. I have quit my day job as a Key Account Manager because I want to build my own online business in order to have a full financial and time freedom. I offer only seldom freelance writer services for other people because I prefer building my own business further. If you are interested in building your own online business as well in order to have a freedom to live and work wherever you want, whenever you want, I recommend taking a closer look at Wealthy Affiliate. They offer a step-by-step training which explains how anyone can build a successful online business. I know many total beginners who managed to create a full-time income stream online. Some of them make even +$10,000/month online. It doesn’t cost anything to get started in WA. Instead, you will be given 20 interactive video lessons and 2 high-quality websites as a gift for joining. You don’t need to have a credit card or anything. Just 10 seconds and you are in. Of course, I recommend their premium services as well but they are not obligatory if you don’t want to pay anything. => Learn to Build a Successful Online Business from Scratch! Have you used XPlace or similar websites? What kind of experiences did you have? Is Upwork Legit? Read Our 100% Honest Review! Is Fiverr Legit? – Read This Before Joining! Is VipKid a Scam Or Will You Make $19/h? Read Before Starting! Is Listverse Legit Or A Scam? Do They Pay $100 Per Article?